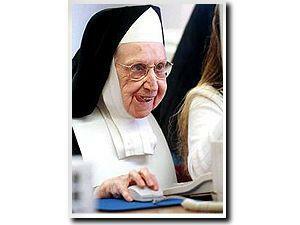 Rooting around on my laptop, I turned out all these lovely pictures of nuns that I collected years ago. It seemed a shame not to share them. 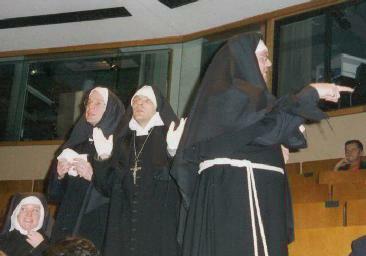 These are Rosminian nuns and wonderful they are too. All of these nuns certainly haven't been on the Gin, apart from the one lingering by the bin .... some empties she needs to expell. 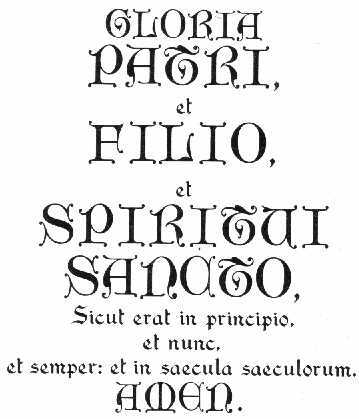 Their order is called the "Sisters of Providence", and they were founded by a friend of Fr Antonio Rosmini, the Marquesa Di Tourne (or someone very much like her). Rosminian gossip reports that she carried a torch for Rosmini and in seeking to further his opinion of her, she founded an order. Its a bit extreme but I suppose she thought "If you can't beat them, join them" (flagelation is not a condonable act of contrition). I bet she loved all the dressing up! Ow isn't she sweet. I think that she was a little lost, or someone has just pinched her moped, or maybe a bit nervous because she waiting for her first date, and he is already 15mins late. Just after I took the photo she started waving, and I thought that she had mistaken me for the latter option, but it turned out that she was meeting Sr Etheldreda of the holy handkerchief. So it was alright in the end. NB. 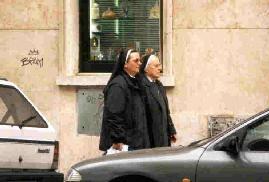 Juxtaposition of the Nun and the 'no entry' sign. Pure coincidence or divine revelation? I didn't say that. 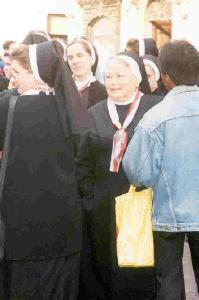 Now, nuns like to have a laugh as much as the next contemplative religious, but this Nun was fantastic. 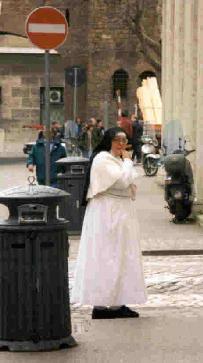 No sooner had I taken the photo than she had the string of postcards off the 'looky-looky' man, draping them over herself and asking the other sisters to take photo's of her on the Spanish steps. Nuns are very clever and never succomb to involuntary actions. This beautiful specimen, is merely licking a spot of candy floss from her top lip. There was no evidence to substantiate the claim that she was in fact looking at the "Hung like a donkey in rubber" fan page. 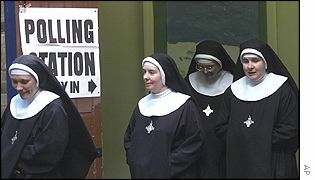 Even nuns vote - so should you. 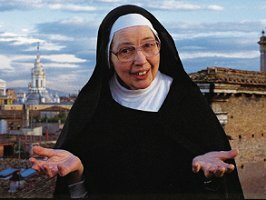 If ever there was a nun who had it all sorted it was Sr Wendy Beckett. She can go all over the world looking at pictures of the male form, talking in that gappy toothed way about sensual men-on-men action depicted in sculpture, without breaking a sweat. Thats Carmelites for you - she's like a damn machine. ...However, Nuns are not toys. Please act responsibly with them. No matter how much children ask for a Nun for Christmas, buy them a puppy. Remember, a vocation is for life and not just for the glamour. ....er...I was young and, well, I didn't really need the money, but I did get on national television. You can see to my left Sr Mary Ginger-Beard telling a man in lader-hosen that if he pinches her arse once more she will @#%&ing smack him. Bless you. Now, be good and say your prayers before bed.